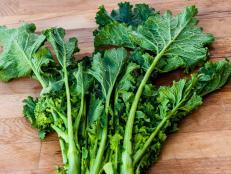 The turnip plant (Brassica rapa) is a cool-season vegetable grown for thousands of years as a staple food for both humans and livestock. 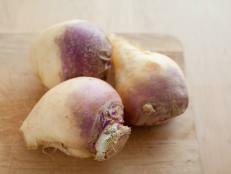 The swollen turnip root, really an enlarged stem, is very high in fiber, vitamins, and cancer-fighting compounds, and eaten raw, stewed, roasted, boiled, and mashed, often with other root crops. 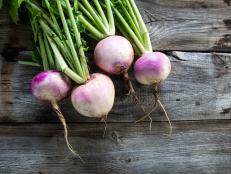 Turnip leaves or greens are high in vitamins, folate, iron, calcium, and thiamine, and are cooked and eaten like spinach or kale. 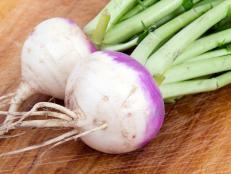 Turnips are often grown as livestock feed, both for harvesting to feed later, or left in fields for browsing animals. They are also planted in the fall for attracting deer to hunting areas. Popular varieties include Purple Top, Royal Globe, Just Right, Tokyo Express, Market Express, Shogoin, and the mild Hakurei. Alltop, Topper, and Seven Top are grown mostly for their greens. 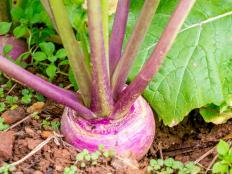 Depending on variety and whether you are growing for tops (greens), small tender roots, or larger roots to store, turnips take from five weeks to two months from planting seed to harvest. 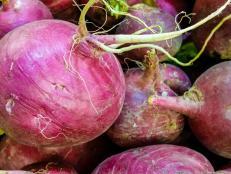 Because the crisp, round root stems grow best in cool weather, turnip growing season in your knowing when the soil starts to warm up in the spring, how soon it gets hot in the summer, and the average date of the first killing freeze. Seeds require somewhat warm temperatures – consistently above 40 degrees F - to sprout quickly within a week or two, so wait until then to sow seed. But try to plant early enough to harvest before it gets really hot, which causes roots to become woody and bitter-tasting. 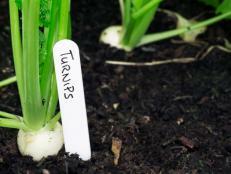 If your growing season is long and cool, continue to plant more seeds every two or three weeks to keep a succession going, lest you end up with too many turnips at one time. 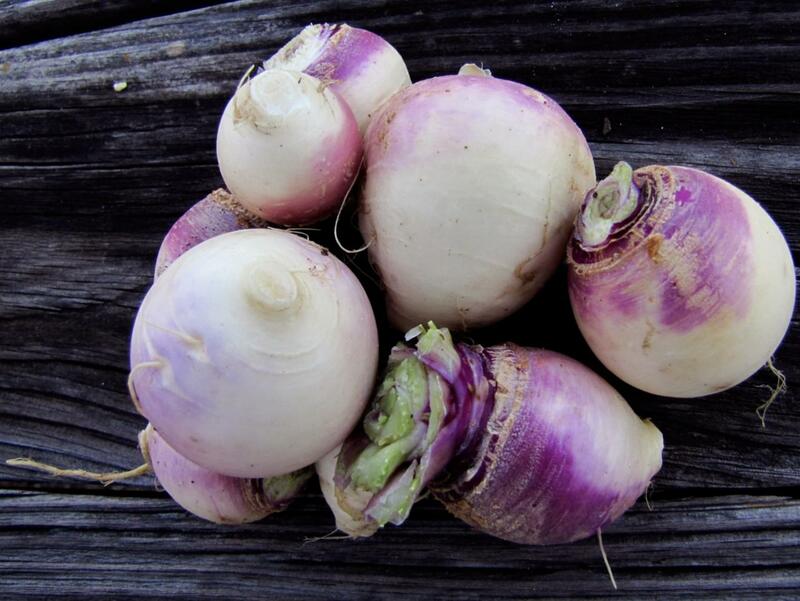 Though the mature plants can tolerate light freezes, and actually taste sweeter after frost, stop planting within two months of a hard freeze, which can kill turnips. In general, this means planting seed in March, April, or May, and if there is enough time for a fall harvest, start a new round in early August, September and October. Again, this is dependent on local weather averages. For more specific guidelines, contact your county Extension Service office for recommended planting dates. 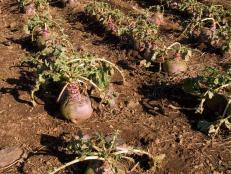 The secret to fast, sweet turnips and greens is getting the seed sprouted in warm soil and keeping the plants growing actively until harvest. This means good fertility before planting, watering during dry spells without keep them wet (which can cause diseases), and thinning young plants to 3 to 6 inches apart as they grow to leave room for fatter roots to form. You can eat the thinned plants. Plant in full sun, in reasonably good soil that is dug at least eight inches deep and with compost added for faster, deeper root growth. Scatter seed lightly, rake them into the top quarter to half inch deep, and water lightly to get them started. 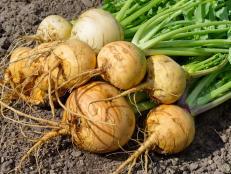 Harvest as you need them, pulling small turnips first and storing for up to two weeks in the refrigerator. 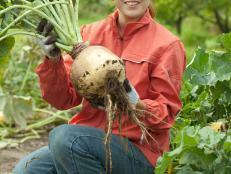 Larger roots can be pulled, tops cut off, and stored in a cool, dark place for months.